Parsley is one of the most popular spices in the world, and it’s used in just about every world cuisine. It’s available fresh, dried whole, or as flakes. Dried parsley flakes, though, provide home cooks with a versatile ingredient. The flakes provide a slightly sweet, yet bitter herbal flavor to dishes. And thanks to its emerald green hue, dried parsley is an ever-popular garnish. The herb’s bitter profile pairs nicely with garlic. Just toss it with garlic as a dry rub for grilled meats. Or the herb works great in green sauces like chimichurri. From soups, to potato dishes and eggs, parsley flakes add the needed hint of bitterness and aromatic herbal notes that’s often missing from dishes. Dried parsley can substitute for fresh. Generally, it’s a 2-to-1 ratio of fresh to dried. Just be sure not to over-season with parsley. 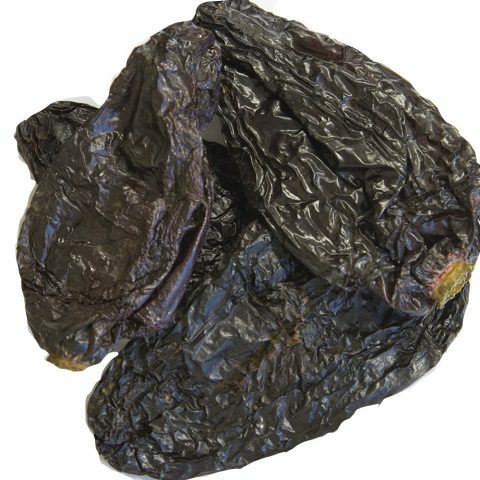 In the right amounts, it adds a sweet, almost spicy herbaceous flavor, but can bring in too much bitterness if overused. Sauces – A dash of parsley adds the needed bitterness that’s often missing from a sweet, tomato-based sauce. It’s also great in green sauces like chimichurri, and pairs nicely with garlic, chilies and other spicy ingredients. Meats – In European cooking, parsley, along with garlic and oil, is a common dressing for chicken, steak and pork. Parsley also complements fish and seafood. 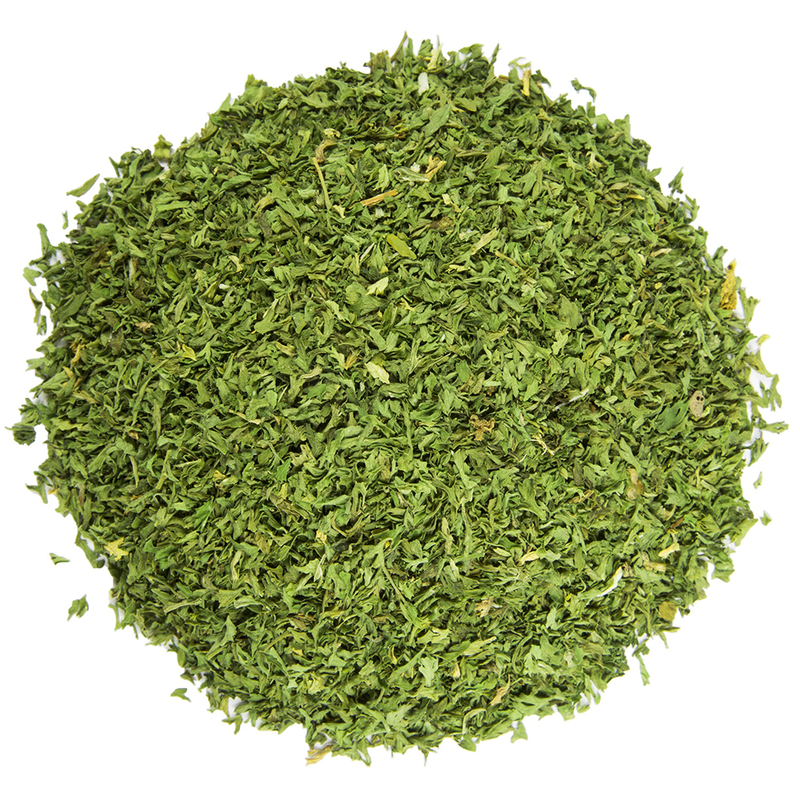 Herb Blends – Parsley is found in many different spice blends. It’s a key ingredient in Fines Herbes, the popular French blend. And many Italian seasonings include parsley flakes. Garnish – Parsley’s vibrant green colors make it a popular choice for garnishing. Sprinkle over eggs, pasta dishes or mashed potatoes for a dash of color. Soups – Dried parsley flakes provide a vibrant flavor to stews, soups and broth. You’ll find it in Italian, French, North African and Mediterranean soups. Parsley is a member of the Umbelliferae family, which includes favorite herbs like cilantro, dill and celery. The plant has been cultivated for thousands of years. The Ancient Greeks, for example, were some of the first to experiment with parsley in cooking and traditional medicine. In fact, the Greeks believed parsley to be a symbol of courage and strength. Legend has it that Hercules made crowns of parsley for noble war heroes and winning gladiators, and the Greeks also used parsley to feed their horses, as they believed parsley made their horses stronger. The Romans were also purveyors of parsley. To the Romans, the herb symbolized life and death, and they used it to adorn their togas for protection. In traditional medicines, parsley has many uses. The herb is used for stomach, liver and lung ailments. Medicinally, the entire plant is used, including the leaves, stems, buds and roots. There are two common types of parsley: Curly leaf and Italian flat leaf parsley. Flat leaf parsley tends to be the common choice in herb blends, as it’s slightly sweeter with a strong herbal flavor. Curly leaf, on the other hand, is also used for herb blends, yet, it’s also a popular choice for garnishes. The parsley plant is a biennial. During its first year, the plant sprouts a strong reddish stem with sprigs that look like the tops of carrots or celery. The leaves are a vibrant green, and feature alternating clover-shaped jagged leaves. If left to grow, parsley bolts at the end of the growing season and starts to produce seeds and small white flower clusters. As such, growers typically replant parsley every year. Egypt is one of the world’s most significant producers of parsley. The plant thrives in the country’s dry, subtropical environment, especially in the Nile River floodplain. Our parsley comes from small, co-op farms near Assam, a city in southern Egypt with many small farms. Our farms tend to be mostly reclaimed desert with irrigation coming from the Nile.